It’s 1858 in Bombay. Rebecca Ravenshaw leaves her beloved India following the murder of her missionary parents in the Indian Mutiny, to return to Headbourne, in Hampshire, England. She expects to be welcomed to her former home, income and safety but finds that someone else has claimed her inheritance. Moreover, the “other Rebecca” has recently died under suspicious circumstances (why was she buried at midnight?) and Captain Whitfield, a distant relative, who happens to be handsome, charming and eligible, now lives in the family home. The real Rebecca must prove her own identity, confront the growing unease she experiences while doing so and cope with her attraction to the Captain. All the elements of a fantastic read! 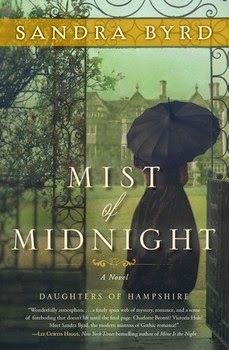 And what a beautiful, haunting book cover! The author vividly describes the colorful saris and gold-clad, hennaed Indian women. Expressions are written in Tamil, and we learn that Chintz, a fabric that was so popular in English homes of the day, is taken from the Hindi language. The book is also a brief history of some of the English missionaries in India as they attempted the tremendous task of not only producing the first dictionary written in Tamil and Bengali in order to translate the Bible into the local languages, but also undertook the job of teaching people to read and write. Descriptions of English life of the day, the horse-drawn cabs, cobbled streets, the manners, the clothes, the “at homes” (particular hours in a day or days when people would visit and take tea together) are real. I loved Rebecca’s comment about being able to ride an elephant, shoot a bird in flight (as she did in India), but being unable to master the English social web - who to know and who to avoid. The author thus seamlessly contrasts and blends traditional Victorian England with exotic India. This is a Gothic love story, but also historical fiction, set against a backdrop of intrigue and danger that will appeal to a variety of readers. It is the first of a series, so we can look forward to more of Sandra Byrd’s excellent story-telling. Note: This book is rated G, suitable for a general audience. Disclosure: Thanks to Netgalley for sending me this book for review. I was not compensated in any other way, nor told how to rate or review this product.